Three years ago, Theatre-Rites and 20 Stories High collaborated on the raw and refreshingly original Broke ‘N’ Beat Collective. Big Up! – being premiered at the Unity at the start of a UK tour – sees the companies marrying their complementary experimental theatremaking approaches once again, this time to create a charming and inventive sensory experience for very young audiences. 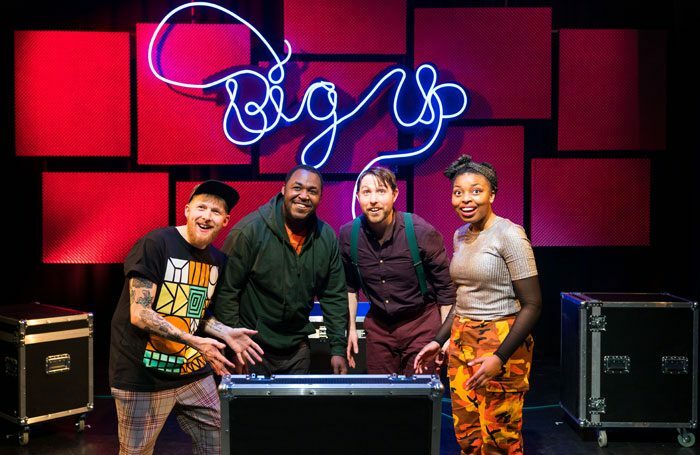 But while the 50-minute mash-up of physical theatre, puppetry, hip hop and music might be aimed at three to six-year-olds, it’s witty enough to appeal to audiences of all ages. The first third in fact is wordless storytelling, the cast’s smiling mime accompanied by a panoply of expressive sounds from beatboxer Hobbit, the combination eliciting infectious giggles from the smallest theatregoers. The action unfolds on a stage that is bare save for half a dozen equipment cases from which light, sound and even actors – a malleable Iestyn Evans, playing a hapless Frank Spencer character – emerge, creating shapes and developing ideas in a world where there appears to be no set rules of engagement. Theatre-Rites’ trademark puppetry comes in a number of forms here, from simple foam shapes that the cast transforms magically and seamlessly into figures, animals, fish, houses and beating hearts, to a Morph-like neon outline figure, to an alien baby straight out of a 1970s Smash advert. It all combines to create a captivating live theatre experience for little ones, and a reminder to the rest of us of how much fun there is to be had when you let your imagination run wild.